So what is data protection? 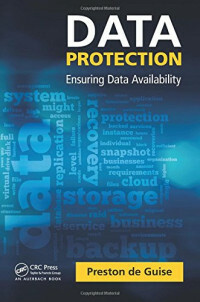 This book takes a holistic, business-based approach to data protection. It explains how data protection is a mix of proactive and reactive planning, technology and activities that allow for data continuity. It shows how truly effective data protection comes from a holistic approach considering the entire data lifecycle and all required SLAs. Data protection is neither RAID nor is it continuous availability, replication, snapshots or backupsâit is all of them, combined in a considered and measured approach to suit the criticality of the data and meet all the requirements of the business. The book also discusses how businesses seeking to creatively leverage their IT investments and to drive through cost optimization are increasingly looking at data protection as a mechanism to achieve those goals. In addition to being a type of insurance policy, data protection is becoming an enabler for new processes around data movement and data processing. This book arms readers with information critical for making decisions on how data can be protected against loss in the cloud, on-premises, or in a mix of the two. It explains the changing face of recovery in a highly virtualized data center and techniques for dealing with big data. Moreover, it presents a model for where data recovery processes can be integrated with IT governance and management in order to achieve the right focus on recoverability across the business. R is a statistical computing language that's ideal for answering quantitative finance questions. This book gives you both theory and practice, all in clear language with stacks of real-world examples. Ideal for R beginners or expert alike.